Downhill Skiing - Hidden Valley in Huntsville, Ontario offers fun skiing and it is located at the north end of Muskoka and just below Almaguin. If you are on a budget that is okay as well because it is only $21 to night ski on Thursdays or get a weekend 4 hour pass for around $40. If you need skis buy them at a Thrift store or use a buy and sell online group. Nothing has to be expensive if you have patience to search for deals. Skijoring - Arrowhead Provincial Park in Huntsville offers Skijoring on Sundays if you want to enjoy a day with your dog. Sometimes there are Outfitters there willing to let you try the equipment for free. You can also come out to the Kearney Dog Sled Races and watch several teams with their dogs. So head to Huntsville on Sunday and all you have to pay is just over $20 for two people to ski. Cross Country Skiing - You can do this anywhere, make your own trails, use the Seguin Trails or the Kearney Trails or again go to Arrowhead Park. This is another activity that can be extremely cheap, you can get used skis, poles and boots easily for under $50 again from Buy and Sell Groups. Most trails are free so to do the activity there doesn't have to be a cost. Ice Skating - Where do I begin.... You can pick up a shovel while staying at a Cottage Resort and clear your own patch of ice. The Town of Kearney has an Ice Rink and so does the Town of Emsdale. Most towns everywhere will offer a free Ice Rink in the Winter. You can also head to Arrowhead Park and enjoy the Ice Skating Trail that wraps around in the bush! Tobaganning - This is an activity where you can just find a hill or make your own small hill in your backyard. We make a hill every year in our back yard down to our lake. My husband will snowblow it to make it easier. The best place to go is Arrowhead Park because they offer tubing and they even offer car load rates which is a great deal. Skate Skiing - This activity can be a little more difficult because the trails have to be wide enough to ski. There are places in Muskoka where you can try this activity for free. I personally have not found a place to try this activity for free but if you know of one please let me know. Snowshoeing - If you want a new pair of snowshoes you can buy at Costo for around $100 or again check out the buy and sell groups. Snowshoeing is free and can be done anywhere. If you are athletic and want groomed trails there are also plentry of those. This is a family adventure that you can do on a budget. You can also rent snowshoes at a local outfitter. Dog Sled Adventures - There are several groups that offer a Dog Sled Adventure and there are loads to choose from. If you want a free trial head to Kearney, Ontario during the Kearney Dog Sled Races and Sugardogs Adveture Company will be offering a free adventure in the town. Snowmobiling - On Family Day Weekend you don't have to buy a trail pass to use the trails so this will help cut your costs for a fun getaway. Snowmobiling is an expensive sport but if you can get someone to take you to the Kearney Ice Caves it is worth it. There used to be a Dog Sled Team that would take you there but I don't think that is happening anymore. Horse Sleigh Rides - This is my favorite even though I only did it once. I will never forget sitting on the sleigh being pulled by a horse and enjoy hot apple cider after. We enjoyed an open bonfire which was a great end to a beautiful day. 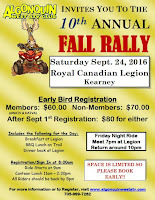 The Algonquin West ATV Rally held in the town of Kearney, Ontario is the best ride Ontario could offer. Enjoy three great meals and a prize at the end of the day. We don't have a lot of free time to get out on the trails but we never miss this ride. Visit Kearney, Ontario towards the end of September every year and enjoy the Fall Colours and amazing scenery. Arrive to enjoy the ride around 7am with the ride beginning around 9 am. If you need any help with accommodations visit Steve Fernandez at Sand Lake Cottages & Inn or text him at 416-419-3415. Sand Lake Cottages offers 4 Cottages and 4 Chalets. The rentals range in size from 1 bedroom - 4 bedroom. If you need to rent an ATV we have several contacts to direct you to. The ATV companies will deliver to Sand Lake Resort. To give you a rough idea you are looking at around $400/day in total including delivery and you get to enjoy it for a 24 hour period. These are current rates for 2016. Also keep in mind that this is just a rough estimate, you would have to contact each company and compare rates. The Almaguin Highlands is by far the best area north of Toronto to enjoy a wide range of ATV Adventures. The crown land in the area is amazing. Atving has grown so much over the past two years. A sport that you can enjoy from early April to late November. 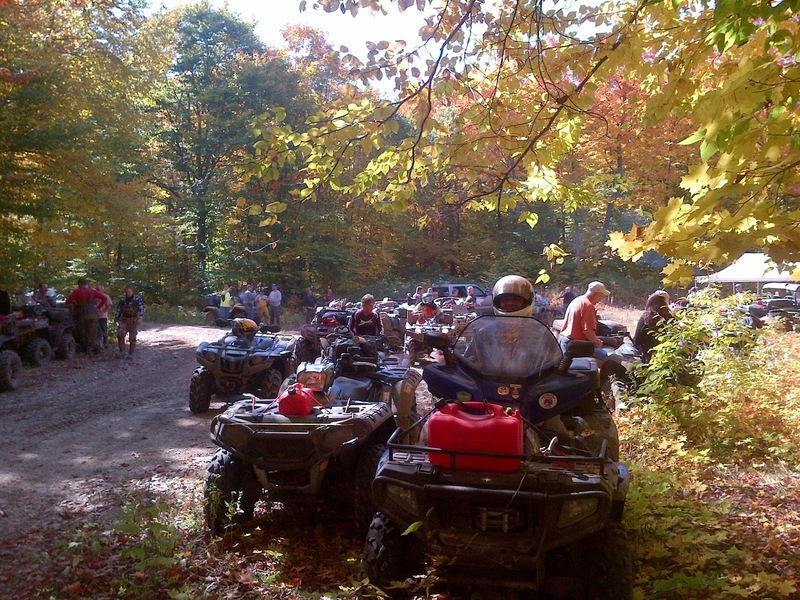 The Algonquin West ATV Club offers the best trail riding north of Huntsville, Ontario. The spring and fall rides sell out every year. Stay at Sand Lake Cottages & Inn located close to the town of Kearney on Sand Lake and very close to the Foresty Tower Road entrance into Algonquin Park. 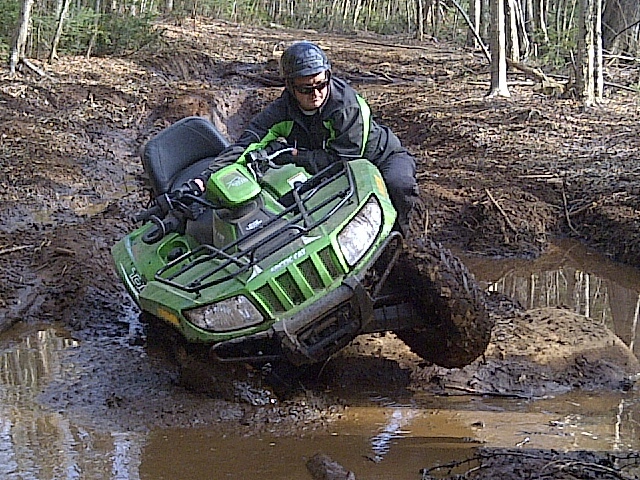 At Sand Lake we really enjoy our ATV Groups as we share their passion. At our Sand Lake Cottage Resort we will arrange to have an ATV delivered from a rental company if you do not own one. Now sometimes our ATV Groups don't want to cook and that is why we offer propane barbecues with propane on every deck and a full size fridge to hold the cold ones. All of our Cottages and Chalets are equipped with full kitchens and supplies if needed or you can ride your ATV 2kms from us and sit at a restaurant and enjoy a great meal by a great chef. All of our places are equipped with television with satellite and of couse the sports channels and we didn't forget that each cottage can have their own private firebowl to enjoy a social in front of the fire. We offer amazing large decks and 5 of our places have lake views. Come out and park your vehicles, unload those all terrain vehicles and kick back. You can access all trails right from our property with a wide variety of trail riding. Sand Lake Cottages will sell you trail permits and maps to support our local club and to help you enjoy what our trails have to offer. Sand Lake Cottages have been in business for 16 years and our number one priority is to provide clean and well maintained Cottage Rentals for our guests to enjoy. Visit The Almaguin Higlands today for your best ATV Trip. Almaguin Highlands north of Huntsville is a growing place to ATV in Ontario. Each year as we expand, the industry is growing larger and larger. Here are the reasons! Almaguin and Haliburton is an associate club giving the both of us over 3200km of mapped, insured and signed trails. Almaguin works with the MNR and ATV Ontario in trail development. Algonquin West ATV Club is also working with the Park to Park Trail System to allow even more access to trails heading over the Parry Sound. The Kearney area which is East of Emsdale and north of Novar you can access two companies where you can service your ATV if needed. 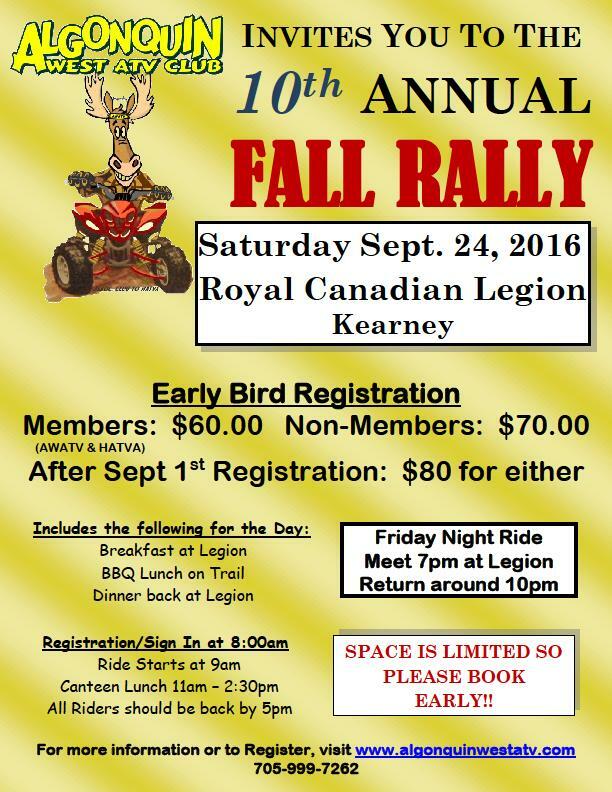 Kearney also offers gas at Fetterleys or visit Sand Lake where you can also get gas at Edgewater Park Lodge. The area offers two general stores, fishing stores, two outfitters, ATV Dealership, gas, liquor store, restaurants and several gift stores. Last of all the ATV Trail System is a very desired system with loads of crown land surrounding Algonquin Provincial Park. The trail riding is fantastic for extreme atving, easy riding and middle of the road trails for those who like a few challenges but they also enjoy easy riding. Our guests at http://www.sandlake.on.ca tell us often that Sand Lake is their favorite riding area north of Huntsville, Ontario, Canada. Having a reputation in the Almaguin area where guests want to return to experience more riding is the key to keeping our ATV Industry alive for many more years to come. The Almaguin Highlands is located north of Muskoka and near Algonquin Provincial Park! The area is known for amazing ATV Trails and ATV Riding. 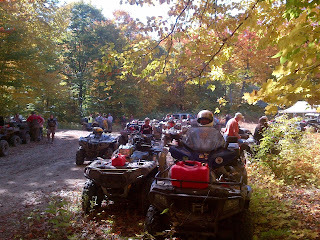 Also don't forget to take in an organized ride with the Algonquin West ATV Club. The Algonquin West ATV Club which started out sometime around 2007 is growing more and more each year. The clubs base is Kearney starting out with 160km of trails has now expanded to over 480km of trails. The trails run from the town of Huntsville, Township of Perry boundary, Sundridge and from the Algonquin Park border in Kearney area. Kearney is the main hub for the Algonquin West ATV Club and the club is now trying to access parking at the trail heads so two-ups and side-by-sides can utilize the trail system. The annual spring poker run is in April and most nearby cottage resorts, cottage rentals, bed and breakfasts and cabin accommodations are filling up fast. The club membership allows atvers access to the Haliburton trail system also which now has over 3000km of trails. I own a Cottage Resort on Sand Lake in Kearney and our customers are telling us that our trails are great for all types of riders. Riders can experience old logging roads, sand dunes and rocky terrain. My husband likes the rocky trails and I like the old logging road trails. ATV Riding is the main business in the spring and fall at our Cottage Rental and followed by that is couples getting away to enjoy our fireplaces and hot tubs. Our main business in the spring and fall used to be fishing and hiking around our resort or in Algonquin Park. The Almaguin Highlands is a great place to enjoy any type of vacation.